The Mornington Peninsula is home to a simply stunning body of water – the Port Phillip Bay. The scenery on the beaches and surrounding the bay is so remarkable, it is enough to bring you to tears. Indeed, it is the place for gorgeous, flawless photographs. Portsea arguably has some of the best looking beaches in this area. The Portsea Pier is home to many weird and wonderful creatures, from the weedy sea dragon to many types of pufferfish. It is the ideal location for a wedding; love is a natural thing, it should be celebrated amidst nature’s miracles. These Portsea wedding photos pose an interesting question: which is more beautiful, the young couple or the crystal blue water? Lowana and Luciano’s Portsea wedding photos are a phenomenal ode to their undying love. The shot of the two newlyweds depicts both them and the scenery in the best way possible. The couple stand in an intimate embrace in the foreground of the image. They seem to be supporting each other, their foreheads gently touching in a moment of complete and utter bliss. The rolling hills, cliff and bay in the background complement the beaming couple splendidly. 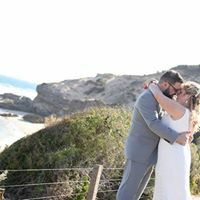 Portsea wedding photos wouldn’t be complete without a photo in front of the Portsea Hotel and JMS Photog raphy have the experience to know all the little hidden gems for any location. The impressive reception venue is on display in these images, its quaint and cosy exterior forming the background of Lowana and Luciano’s big day. A photograph of the two lovers in front of the venue, leaning against a fabulous black car, serves as the perfect example of what a wedding photo should be. The personalities of these unique individuals are vivid, and shine through the image. A photograph of their wedding party in superhero costumes similarly reveals how strong Lowana and Luciano’s relationships with their friends and family are. Their sass and humour will be known by all who view these photographs, both now and in the future.